One of the most common aspects of Fibromyalgia and M.E (Myalgic Encephalomyelitis) is the lack of sleep that can be experienced by both sufferers. 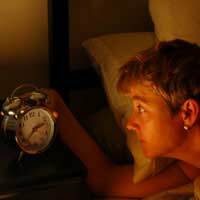 Insomnia is a regular and frustrating characteristic of these conditions and is sometimes known to occur for days at a time in the case of both conditions. Simply put Insomnia is a lack of sleep even when the body and brain are tired and want to sleep; it can sometimes last for a day or so or last anything up to a week at a time and in extreme cases it is necessary for a sufferer’s doctor to medicate in order to provide short term relief to the problem. There are many things that can lead to a lack of sleep but the most common cause of sleep deprivation is stress. Many sufferers of both Fibromyalgia and M.E (Myalgic Encephalomyelitis) are frustrated by their conditions especially if they are chronic. Some sufferers may experience acute symptoms which may only last for a day or two at a time but chronic sufferers can experience the symptoms of their illness for weeks, months and even years at a time without any let up. When this happens so to does lack of sleep. If you are feeling stressed this may be because of problems at work or at home, financial considerations or simply because the nature of your condition is causing your anxiety. In the case of these people are suffering lack of sleep because of problems at home or at work then the easiest way in which to relieve the problems is to discuss them. This may sound like too much common sense but it is indeed the healthiest way to relieve stress. Try spending a little time on your own; this does not have to be away from home – it can be relaxing in a hot bath after work, reading a book, listening to some music or going for a stroll after work. If your illness is causing your stress levels to rise then you should consult with your doctor. He or she will offer advice on how to best relieve your stress and may even offer you a short term course of medication to help you sleep. It is important to remember however that sleeping pills, although a short term solution to the problem, will begin to lose their effectiveness if used continually. You may wish to try a so-called alternative therapy; this is a treatment that does involve prescription medication but you should still consult with your doctor before embarking on such a therapy. A common alternative therapy is acupuncture – this involves inserting hollow needles into certain points of the body in order to bring about a release or relief from any number of complaints. Acupuncture has been known to help individuals who are experiencing sleep loss and also individuals who have difficulty giving up smoking etc. This is one of the most common symptoms of Fibromyalgia and M.E (Myalgic Encephalomyelitis) – it is also known as Chronic Fatigue Syndrome and many sufferers experience tiredness, listlessness and heavy limbs even after they have slept for many hours. If this is a problem you are experiencing on a regular basis and are not in receipt of prescription sleeping medication then you should consult with your doctor as soon as you can. You should also, where possible, avoid driving and using heavy machinery. Your doctor may not be able to offer any medication as both Fibromyalgia and M.E (Myalgic Encephalomyelitis) are not curable but he or she may be able to offer advice on how to structure your day more effectively so that you can gain further rest without sleeping at the wrong times.